I woke up on Saturday morning with the intent of trying something different from day one, so the first thing that I did was pack a different set of pens. I usually use the brush pens, but started to wonder if using them on the balsa wood was taking an unnecessary toll on the brushes. I also knew that I wanted to work with paper on day two using a stack of paper remnants that I used for the VF16 and VF17 printmaking exhibitions. Instead of the brush pens, I brought my 48 color set of Faber Castell marker pens with me. I arrived at the gallery and saw a proliferation of works on the wall as well as on the floor. I had spent the entire first day working on the floor and that took a toll on my lower back, so I decided to take up residence on a stool for the second day. 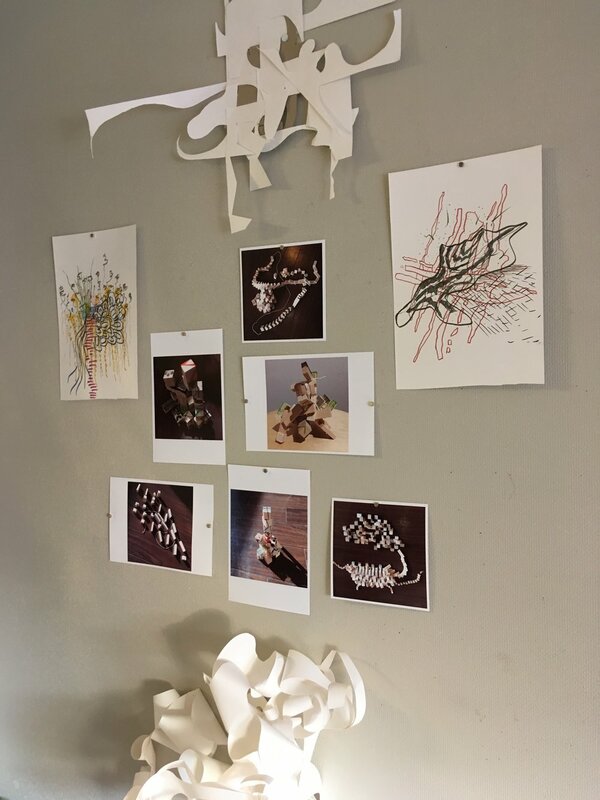 I pulled out paper and began cutting them in to long and curved forms which I then curled, twisted into new forms attaching different portions of the form together with double-sided tape. Each of the forms was about 6 x 6 x 6 cm and I began creating more and more forms and then attaching the modules to each other to create a larger form. The final form reached a size of about 40 x 40 x 40 cm which I placed on the floor. While working on this form, a steady stream of artists came into the space to continue or begin the works while listening to the sound work files that Marcos had put on. 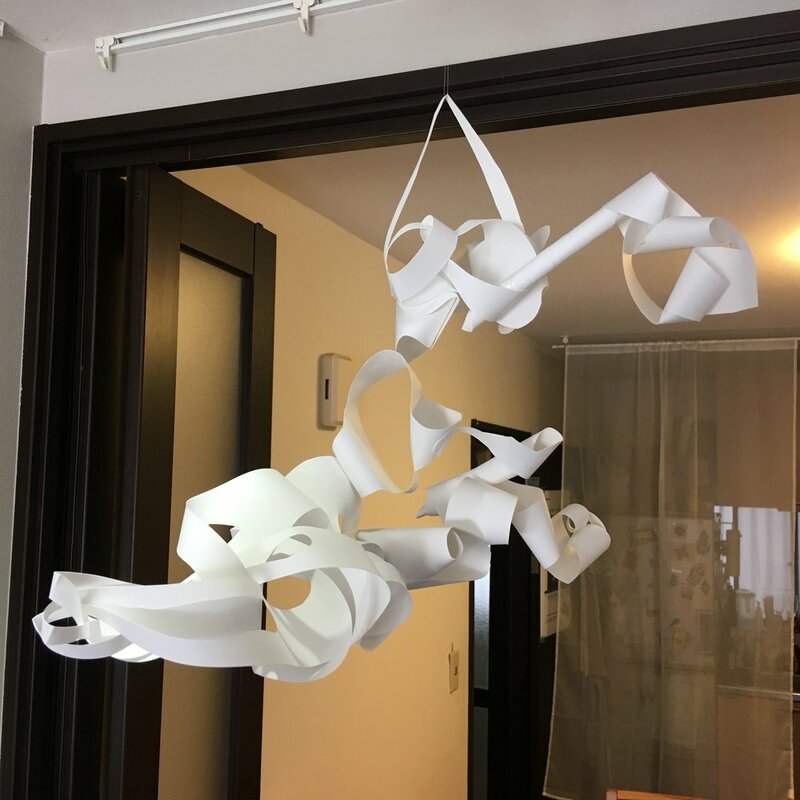 At the suggestion of a couple of artists, I decided to hang the form from the ceiling. The paper I used was rather thick and the tight curls and rolls that I used added tension to the forms which could not be sustained by the 100 yen shop double stick tape. Over the course of an hour, the form started to become unglued with modules dropping away from the form onto the floor. Eventually, I decided that piece was better left on the floor. I reconfigured the modules and ended up with this form. My next sketch was to make another form using different sharp angled edges, almost star-like. Barely two forms in, I decided that it was not working and started drawing on one of the forms, but in complete dissatisfaction crumpled the two forms up and started over. By that time, the cardboard holder for the double sided tape had completely fallen apart and the floor around my stool was littered with paper remnants from the cut curved forms. In the vein of my Remnants of Memory collage project, I used the paper remnants and the cardboard holder for the double-sided tape to create this. Throughout the afternoon, the space was quite lively with eight artists working at one time for several hours and more artwork filling up the space. As the afternoon turned to dusk, there were still four or five artists working in the space. With the live performance of Still-Life coming up at 6 pm, I had little less than an hour left after finishing those two sketches. I settled down on a stool and started making a pair of drawings using my marker pens while consciously responding to the sound work files through color choice, type of mark-making, and speed of mark-making which resulted in these two drawings. Still-Life, which consists of a pair of artists, set up their performance space on the gallery floor and laid out a variety of everyday objects as well as an intriguing wooden box which kind of looked like an accordion (you can see a portion of it in the left hand corner of the image below. Artists were invited to make work during the course of the performance much like we had been doing with the sound work files. I grabbed a piece of paper and put my marker pen set next to me. 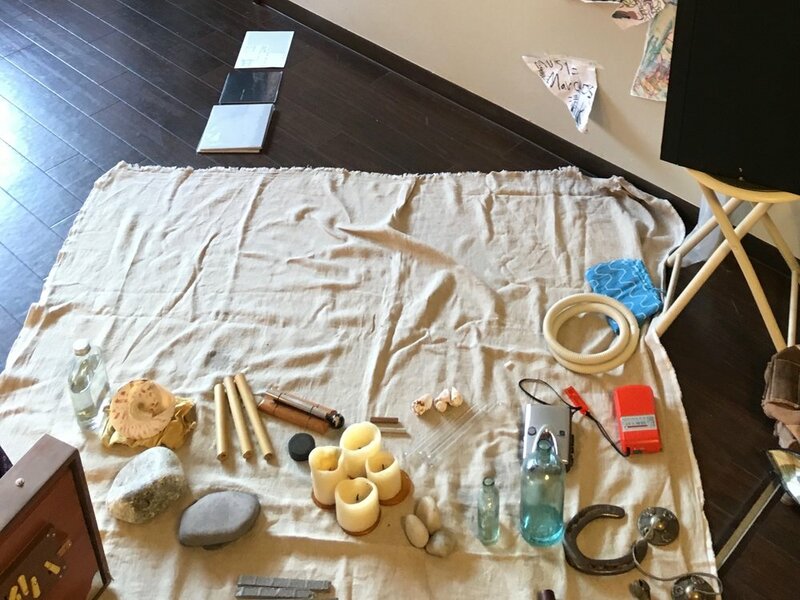 It was a very meditative and minimal performance using objects as percussion and wood instruments while also running taped sound works or radio frequencies during the course of the performance. I did my best to respond to the sounds quickly and adapt with changes in sounds and feeling. I ended up with a rather chaotic drawing that was full of colors and unfinished forms. For those you interested in seeing the end result of this drawing, you will have to come to Launch Pad Gallery to see it! After the performance, Still-Life talked a bit more about their project and process and we were also able to ask questions about the objects that they used. The wooden accordion-like box turns out to be a shruti box with origins from India. I ended up picking up one of their CD's which I uploaded to my computer and have listened to while doing work, trying to keep one ear focused on the sounds generated from the duo. By this point in the evening, I knew I was finished for the day. I put up my drawings and rearranged some of the pieces and headed back home after a very satisfying second day at Future Sound + Future Vision.